Laryngograph® introduces an affordable computerised workstation for fibreoptic endoscopic evaluation of swallowing. Digital FEES brings the power of a PC to swallowing evaluation. The video is digitised directly to the hard drive of the host computer. Physiological signals are synchronously presented with the video images. 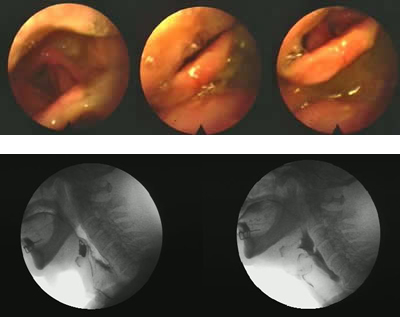 A complete swallowing report with stills from the examination is easily generated and printed. Videofluoroscopy images can be acquired and managed in the same way as live video images. Digital FEES means no more bulky video tapes or struggling to locate a previous examination. Simply connect the camera to the PC for high-quality digital video recording to computer media. An intuitive user interface gives instant access to examinations, simple playback and editing, side-by-side comparison of recordings for evidence based outcomes, comprehensive report facilities and easy data archiving. Click here to see an image of a Digital FEES system. A complete FEES workstation supplied with a light source, camera and flexible nasoendoscope or use existing equipment. Runs on desktop or laptop PC. Portable – examinations can be carried out at the patient’s bedside. Optional video synchronised movement sensor (Gx) identifies important pharyngeal swallowing events. Two channels of analog input for auxiliary signals e.g. EMG, Gx, auscultation, speech, pressure. Automatic report generation in Word® with colour stills. No videotape means instant access to digital video images and easy reviewing. Easy archiving onto CD or DVD+/-RW. FEES® is a registered service mark of Susan Langmore, Ph.D.